What do motorists really mean when they say “cyclists should pay road tax”? Mark Cavendish was victim of some road rage yesterday, while out on a training ride in Essex with Russell Hampton. Although the episode was mentioned on Cav’s Twitter account the story was billed as an “Exclusive” in The Sun and was then picked up by Yahoo/Eurosport. Naturally, the @cyclehatred lovers started piling in, accusing cyclists of causing danger on the roads and all the usual guff. 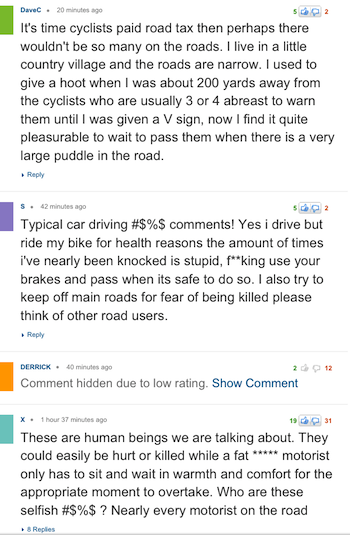 And it wouldn’t be a hate-fest if there wasn’t a mention of “cyclists should pay road tax.” But this particular commenter is more honest than most: he lets slip why he wants cyclists to pay road tax, so there would be fewer cyclists on the roads. Nowt to do with financial fairness (everybody pays for the roads, not just motorists) and everything to do with wanting roads to be for cars only. This, deep down, is what many road-tax fixated motorists probably want. They want us out of “their” way, off “their” roads. Cyclists are pesky and slow, goes the unthinking thinking. They ride two or more abreast; they wear Lycra; they slow down legitimate – ie motorised – road traffic. Those who want cyclists to be registered, want them to display their registration details on big number plates. They may also want bikes to carry signal indicators. Maybe another two wheels would be good, too. And an engine. Oh, hang on, that’s a car. When you hear a call for compulsory cycle training, bicycle licensing and excise taxes (“just pennies a day, why would you object to that?”) it’s not a call for fair-play, it’s a call to drive everywhere. Those who want cyclists to be trained, registered, pay ‘road tax’ and apply for licences to cycle don’t want to share the road with lots of licensed, fee-paying, trained cyclists, they want less cyclists full-stop. The ‘no pay, no say’ crowd would use any payment as a “but you don’t pay enough” argument. This entry was posted on Sunday, December 9th, 2012 at 6:28 am	and is filed under No such thing as road tax!. You can follow any responses to this entry through the RSS 2.0 feed.